Once market replay data or historical tick data is available by either recording or downloading (See the "Set Up" page of the Help Guide), it can be replayed in all NinjaTrader windows. The Playback connection should now be connected and the Playback Control should be visible. Note: When disconnecting, the Playback account's trade history will be reset. Once connected to the Playback connection (see the "How to connect to Market Replay data" section above for how to connect), the Playback control window will appear. In the caption bar of the Playback control you will see the current date and time of where the play head is located. Select either "Market Replay" or "Historical"
Each successive click increases the speed of the playback. Playback of "Max" will process data at fastest possible speed. Notes: When changing dates in the Playback control window, open windows will not update to the new dates right away, but will wait until focus is taken away from the field being edited. When adjusting Slide control, the Playback account's trade history will be reset. Brings up the Historical Data Window window. Instruments with replay data will be displayed with the level 1 (L1) and level 2 (L2) Begin and End dates and times. Brings up the Go To window where you can specify a date and time to jump the replay file to. There must be recorded data available for the selected time. Tip: Should you be using the Playback for testing a NinjaScript strategy, please be sure the chart you apply the strategy onto has bars populating it prior to the start time of your replay. Playback supports running on Market Replay data or Historical data. Market Replay data is the most accurate and holds both level I and level II (market depth) data. 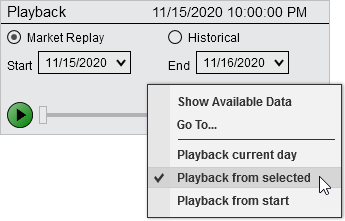 If you do not have market replay data for a time frame, you can choose to playback historical tick data. However using historical tick is less accurate as there is no level II data. NinjaTrader stores level I and level II together in a single market replay file to ensure that level I and level II events are perfectly in sync per instrument. Market replay files have the ability to record time stamps down the 100 nanosecond level. However please note that we use the time stamp provided by the market data providers when storing data. This means that you are limited to the granularity of the provider if the time stamp is natively provided. Please see the Historical & Real-Time Data section of the help guide for more information. Note: When using market replay, the NinjaTrader core market data updates occur at the granularity provided by the market data provider. However, the NinjaTrader user interface only visually updates in 1-second intervals for performance optimizations. Even though the NinjaTrader UI's are only visually updating at 1-second intervals, orders and indicators will calculate just as they were running in real-time. To provide the highest possible playback performance the visual update interval is 1 second, please note though that order fills and indicator / strategy calculations are processed with the highest time stamp granularity possible still. When using Historical data for playback NinjaTrader will use historical tick data for playback. If the tick data from your provider is stamped with ask and bid data then NinjaTrader will use that to simulate the ask and bid price during playback. If your historical data provider does not support ask/bid stamped tick data then NinjaTrader will simulate the ask and bid price by setting it either to last price or last price +/- 1 tick at random. Note: Ask and Bid Volume during playback with Market Replay or historical data will be simulated and set to "1" except for Equities and Forex, where "100" is used for Equities and "100,000" for Forex. When submitting orders to the Playback101 account, these orders are processed immediately and synchronously. This enables reproducible results for strategy developers that run a strategy on the playback connection. Playback101 and Sim101 work differently when executing, since simulated internet latency delay simulation is not present in playback.